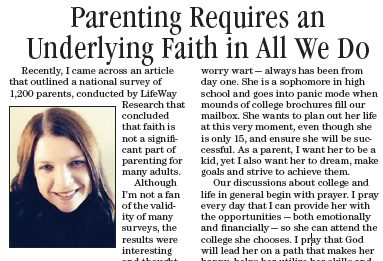 Recently, I came across an article that outlined a national survey of 1,200 parents, conducted by LifeWay Research that concluded that faith is not a significant part of parenting for many adults. Although I’m not a fan of the validity of many surveys, the results were interesting and thought provoking. According to the survey,parents defined traits of successful parenting as children with good values (25 percent), children who develop into happy adults (25 percent), children finding success in life (22 percent), children who are deemed as “good people” (19 percent), those who graduate from college (17 percent), and those who live independently (15 percent). Ironically, according to the survey, being godly or having faith in God was only mentioned by 9 percent of the parents surveyed. The survey concluded that parents have instead put an emphasis on guiding children to a social morality and toward a “happy” life versus spiritual development. The interpretation, in my opinion, fails to acknowledge that faith can be a very important factor when parenting children to have strong values, seek happiness and find success in life. As a parent, I want my children to graduate from college, live independently and ultimately, view themselves as successful; however, when I’m doing my best to teach them values and guide them through the tasks to achieve their goals, faith must be a present at all times. For example, my daughter is a worry wart — always has been from day one. She is a sophomore in high school and goes into panic mode when mounds of college brochures fill our mailbox. She wants to plan out her life at this very moment, even though she is only 15, and ensure she will be successful. As a parent, I want her to be a kid, yet I also want her to dream, make goals and strive to achieve them. Our discussions about college and life in general begin with prayer. I pray every day that I can provide her with the opportunities — both emotionally and financially — so she can attend the college she chooses. I pray that God will lead her on a path that makes her happy, helps her utilize her skills and help others in the process. I’ve taught my children to work hard, think about the well being of others and ways we can serve the underprivileged — all with faith guiding us along the way. I’ve told my daughter that we will work through the college applications, weigh the options and ultimately make a decision that feels like it is driven by our faith. My own mother has always told me that when I can’t fix a problem or I’m struggling with a challenge — whether it is work-related, relationship-based or all about parenting — that I need to put it in God’s hands. She has reminded me time and time again to put the names of those who have hurt me in the Bible and let God handle the rest. I try to teach my children the same. Faith guides those lessons on success, happiness and values. So, even though this survey accounts for each parent’s parenting strategies, what it fails to mention is that faith overlaps everything we do as parents. And I hope it always will.